Adil Dalal, CEO of Pinnacle Process Solutions International, headquartered in Austin, TX, received the 2014 Global Award for Outstanding Contribution to Quality and Leadership. 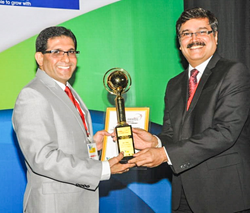 The award consisting of a trophy and certificate was presented to Dalal on June 27th by Prashant Hoskote, the Senior Director of Max India Group, in a ceremony at the 2014 World Quality Conference held at Taj Land’s End, Mumbai India. The Global Award for Outstanding Contribution to Quality and Leadership is the most prestigious award and the highest honor at the World Quality Conference, which an Individual can receive for his or her contribution. Winners of this award are selected by a global research committee and an eminent global jury and council of board members to recognize the Best of the Best for Excellence in Quality Management, Leadership, Business Process Improvement and Benchmarking of Quality practices. It aims to honor those who have distinguished themselves as global leaders within their respective industries and those who openly share their breakthrough innovations and demonstrate exceptional initiative and sustainable results. Dalal is also the winner of the prestigious 2014 Shingo Research and Professional Publication Award and the 2013 Axiom Business Book Medal for his pioneering book, The 12 Pillars of Project Excellence. The World Quality Conference attracts leaders from around the world to discuss issues related to quality and leadership. Dalal was the keynote speaker at the conference, where he discussed “The V-Factor: A Quantum Neural Pathway to True Leadership, Creativity, and IN-novation.” Conference attendees gave high praise to Dalal’s talk, which was based on Dalal’s distinctive and innovative methods for showing global leaders the power of visualization™ and how it can be used to unleash the “V-Factor” in leaders. The comments after the conference, indicated that the Sr. Executives found the presentation quite stimulating and intriguing. One of the executives also followed-up and mentioned that he was able to apply the innovative concepts presented by Dalal with his team quite effectively. As CEO of Pinnacle Process Solutions International, Adil Dalal has more than 18 years of personal experience in providing breakthrough solutions for businesses, bringing millions of dollars in profits for organizations around the world. His innovative approach is to create long term success and lasting transformations within individuals, corporations, organizations and governments by focusing on enhancing the value of the 'appreciating assets' and optimizing the human potential while developing the required technical skills. Dalal also serves as a board member on several non-profit organizations and is an award-winning author, innovative sensei leader and humanitarian, as well as the host of his own radio show. Dalal holds two master’s degrees and multiple certifications and is currently pursuing a PhD in Performance Psychology from Grand Canyon University. He is the author of the multiple-award winning book, The 12 Pillars of Project Excellence and is also the author of “A Legacy Driven Life”, and a co-author of “The Lean Handbook, ASQ” and “Changing Our World” which has been widely received by business leaders throughout the world. For more information visit http://www.pinnacleprocess.com.